We will commence taking reservations for Phase 1 occupancy on February 22. If interested, please call our reservations department at the resort who will take reservations for stays starting on June 1, 2018. In order to determine the number of units available for occupancy, we are in the process of contacting fixed week owners with usage in the Phase 1 units as well as flex week owners with existing reservations after June 1, 2018. If you have a reservation or fixed week in Phase I units from and after June 1, 2018, and have not been contacted, please check with OBBR reservations staff at 888-784-6688. Since our last posting, construction of Phase I has made substantial progress. The drywall repair, painting and trim work for all of the units in Phase I is about 70% complete. The work crews are moving quickly and will have the rooms ready in the next six weeks. Roofing is almost complete on Mainsail and is underway for the other buildings in Phase I. Roofs are either being replaced or repaired. The entire Mainsail roof is being replaced. The new roof is installed, and the project is 80% completed. All of the old windows and doors in Phase I have been replaced with new hurricane rated sliding glass doors, French Doors, windows, and frames. All the air conditioners in Phase I have been repaired and where necessary, replaced. All rooms in Phase I are being fully furnished. Most of the furniture is on site, and that work will progress shortly. The repairs to the pool and deck are about 60% complete. The old deck has been removed, and the area is prepared to receive the new shell stone pavers and coping. The pool and pump room are being repaired prior to the installation of the stone tile. The pool will receive another coating of Diamond Bright pool concrete to bring it back to its original condition. 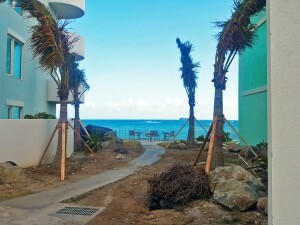 Newly purchased palm trees and other tropical specimen plants, are now planted around the pool and other areas replacing many of the palms destroyed by the storm. Many of our old palm specimens made it through the storm and are growing at a rapid rate. With both the new and the old palms in full growth by June 1, we are confident that the lush landscape of the resort will be restored. The Infinity Restaurant and Bar are in full operation three days a week. The food and ambiance are great, and the restaurant is proving to be a favorite among the locals, especially on Sunday when we have over 60 people for brunch. The restaurant, pool, and bar will be ready and very willing to serve our owners, guests, and friends on a seven-day schedule starting June 1, 2018. Edith and David are happy to be back at the bar and Russell, and the rest of the kitchen staff pleased to be preparing meals in our restaurant, but they say that they really miss the owners and anxiously anticipate the opening. We announce the departure from our staff of Anne-Marie Brooks, our long time, much loved, Assistant General Manager. We are happy for Anne-Marie because she is moving up to be the General Manager of Divi Resort, just down the road. There is no one else we can think of who is more deserving of this elevation in job and status. Anne-Marie has spent 20 years at OBBR working tirelessly almost every day with her positive can-do attitude. We are not losing a friend as we will continue to be in touch with Anne-Marie and we take pride in watching her bring her considerable talents to Divi. Good news is, we are keeping Beau Beau (Leroy Brooks) who will continue to provide weekly entertainment and host our Monday night Manager’s cocktail party. Her replacement will be Anju Snow, an employee of both OBBR and CBC and a twenty- five year Island resident. She has a wealth of hospitality experience working in many high-end hotels throughout her career. Most recently, she has worked with our staff very closely in managing the Lighthouse and Coral Beach Club rental program for the last year and has done a fantastic job. She is people oriented and has energy, style and loves to please people. We will provide more information on Anju soon. While we will miss Anne-Marie, we are confident that Anju will be a fantastic Assistant General Manager. Anju together with our management team of Ricardo Perez, Mientje Brown, Cindy Clark, Lorenzo Bryan, Ursula Illis and Ninoska Lambert will continue with the excellent hospitality and service that you have enjoyed over the years. While we have ordered two new replacement elevators for Mainsail, their delivery and installation is a long lead item. We are working hard to get the new elevators installed by the grand re-opening on June 1, but unfortunately, we cannot guarantee that they will be functional by June 1. As all Mainsail units will be ready for occupancy, the upper floor units may be a challenge for some people to use as the stairs will be the only way to access these units if the elevators are not yet operational. For those with issues climbing stairs (up and down four flights), please talk to reservations and they will try to accommodate you elsewhere if the elevators are not ready during your visit. However, we will not be able to hold two reservations at the same time. We will know more about the availability of the elevators in the next 30-60 days and can give a more accurate assessment at that time. We were pleased to observe that the Island is also progressing well with its reconstruction. 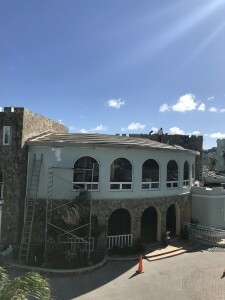 Steady progress is being made on the housing and commercial buildings in St. Maarten. The government of The Netherlands has made $625,000,000 available to the Island for welfare and reconstruction. The money is being distributed now, and the impact can be seen and felt. Many more restaurants have opened including a new and very attractive one that’s sure to be among the most popular on the Island. Emilio’s opened in November 2017 and is in Emilio Wilson Estate, the home of the new, highest zip line and chairlift in the Caribbean. It’s a great restaurant and opening now is very good for our Island. We’re sure that the restaurant and new chairlift/zip line will be added to the list of fantastic activities enjoyed by our owners. All over the Island, normalcy is returning. It’s reassuring to see the attractive and unique Caribbean style homes restored and Front St. busy with thousands of tourists from the cruise ships, patronizing the newly renovated stores and many other signs of normalcy. We still have a long way to go before the Island is fully “back” but the spirit and remarkable resolve of the people and their dedication to bringing their friends back to their Friendly Island is definitely notable all over St. Maarten. It is the intention of the government and the people of St. Maarten to not only restore what was there but to improve on it and to make St. Maarten the premier destination in the Caribbean in the next two years. The airport is under construction and is projected to be open in nine months. In the meantime, a sophisticated canvas and steel building is being built to house the airport functions. As the Island opens for tourists and more fly down, more air routes will be added. We are still working with the insurance company. They promise a resolution to the claim in the near future. We will contract for phase II and III when they have indicated the amount of the settlement. It is expected that phase II and III will be completed on time and the entire resort will be reopened by December 2018. We are very excited about our opening and are already making plans for the day. The entire staff is looking forward to greeting the owners to OBBR once again. We again thank the owners for their continued support of our resort.